Welcome to the Warzone Firefight preview, friends. Next Wednesday, the newest Halo 5 content release will arrive, and it’s bringing a bunch of friends with it. Between new maps, the Warzone Firefight game mode, Campaign Score Attack, new vehicles and REQs, new enemies, a new Forge canvas, and plenty more, it includes a ton of goodness that we hope you’re excited to jump into when it drops on June 29. 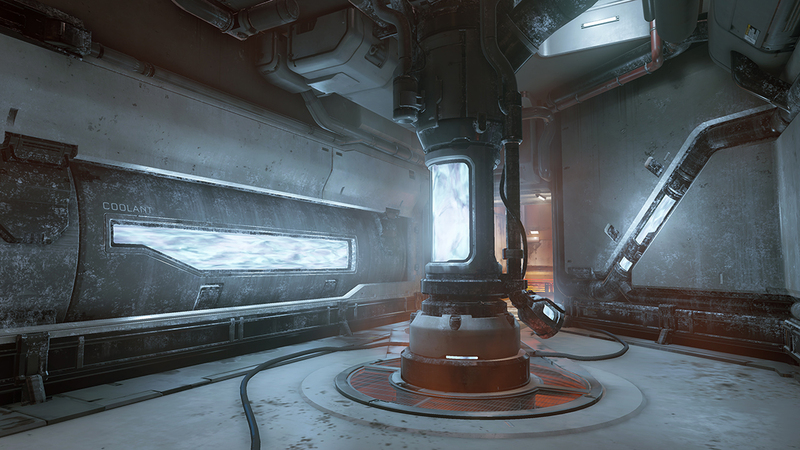 To get you ready for Halo 5’s biggest release yet, we’ve prepared this Community Update with extensive developer commentary on a few of the things you’ll find next week. Additionally, the live stream team is hard at work putting the finishing touches on next week’s show, which will take place on Tuesday, June 28 at 2 P.M. PT sharp. Don’t be late. Today, we’ll hear from designers, developers, and artists on some of the things they’ve built for you, plus a bit more. Let’s get into it. 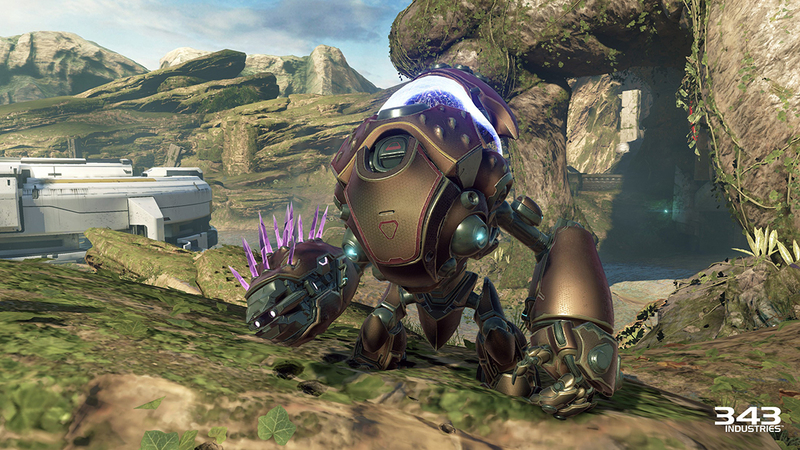 Also, if you haven’t yet caught the full REQ Reveal for Warzone Firefight, you can catch it here. Since beta, the Warzone Firefight team has been reviewing your feedback and putting in the time to make updates before the final release. To get the details, I chatted with the some of the folks who are doing said hard work. Take it away, guys. If you’re not familiar with Warzone Firefight (What’s wrong with you? 😊), it’s our brand-new 8-player Co-op mode where you and your Spartan squad must overcome 5 rounds of increasingly difficult objectives to rack up huge scores and emerge victorious. If you are familiar with Warzone Firefight, then chances are you participated in our pre-release beta back in April. And believe me, you were not alone. We were blown away by the community response to beta. Whether internal telemetry, community forum posts or social media replies, we gathered a treasure trove of information and used that data to update and improve the entire Warzone Firefight experience. Your participation and subsequent feedback helped to inform our work for the June release. What’s changed since then you ask? (Even if you didn’t I’m going to tell you anyway because that’s why I’m here). Since the beta, we’ve done a top-to-bottom difficulty tuning pass across our scenarios to ensure success percentages are more in line with our desired metrics. One particular pain point in the beta was the dreaded “Defend the Garage” objective on Escape from A.R.C. Less than half of the squads that encountered this particular threat completed the task. That was the largest single outlier we saw in the beta and probably too tough for Round 3. To help simplify things, we’ve updated our HUD and UI elements to better inform you of your success rate or lack thereof (more on that later.) We’ve also simplified the logic of the objective. You no longer have to kill the designer-prescribed number of enemies without them capturing the location to complete the round. Now, you simply need to keep the enemy from capturing the location before times runs out. However, aggressive players will have the opportunity to complete defend objectives faster by clearing out the majority of the attacking forces. You’ll want to make sure and communicate your Warthog run away from the base ahead of time to make sure you always have friendly forces in the base to block capture progress. Yet another change we’ve made to up the challenge since the beta relates to the respawn timer and adding more of a “penalty” for dying. After numerous playtests and internal discussions, we settled on a design where the respawn timer increases by 5 seconds for all players after successfully completing each round, so dying in Round 5 will have a bigger impact on your squad’s damage output than earlier rounds. This change will require greater team coordination and communication if you want to consistently succeed. And now to talk a little bit about other additions we’ve made since the beta is David Garza, game dev extraordinaire. Hey everyone, I'm super excited for you all to finally get a chance to play our new mode! However, the flip side of that coin means I'm now faced with the unenviable task of making incremental UI improvements sound fun and exciting! Joking aside, the feedback we got from you during the beta was incredibly valuable and we hope these improvements will make it so that things are more clear and there are less barriers in between you and fun. One of the big pieces of feedback we received from the beta was that it wasn't always obvious what round you were in or what the goal of any given round was. So, to help remedy this, we added a brand new splash feed that shows up at the beginning of each round. It shouts, loud and clear, the round number and what you need to do to succeed. It's front and center and literally comes in with a "splash" (hence the name). 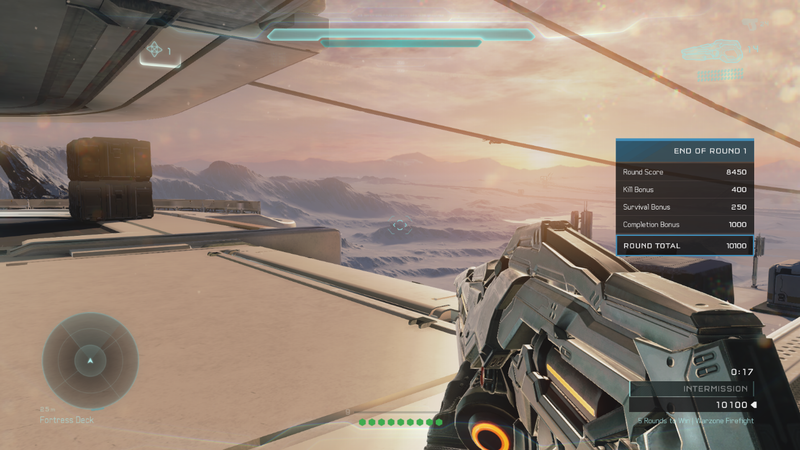 Another thing you'll notice when you fire up Warzone Firefight is that we've made some updates to the mini scoreboard in the bottom right of the screen. Aside from showing your own personal score on the bottom half, we've also updated it to display your team's progress towards the current round's objective on the top half. Depending on the goal, the scoreboard will look and act different in order to inform your squad as to how the round is shaping out. For instance, if the goal is to eliminate 100 Grunts, a red bar will fill from right to left as your team takes each one out. 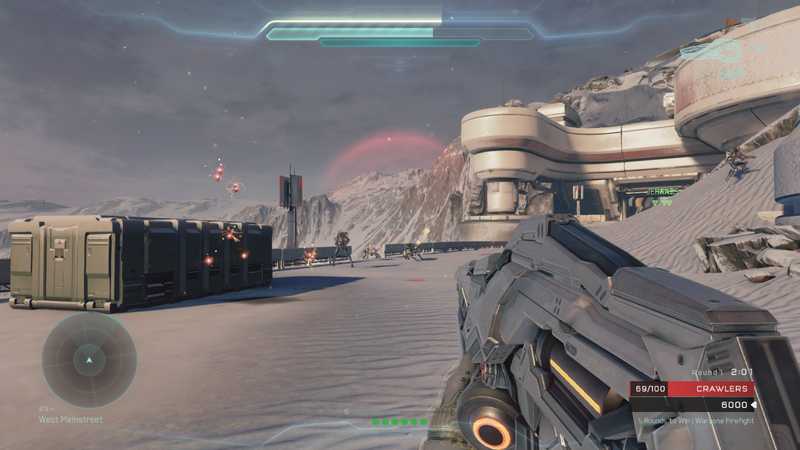 Or if, for example, your team needs to defend the Armory, a blue bar will slowly shrink from left to right as the enemy AI captures the base. You may remember from previous Firefight modes anytime you gained points for defeating an enemy that a score value would show up to the right of the reticle to tell you how much you've just received. We were able to add a very similar piece of UI for this release which we've called (wait for it...) the "score feed". It works very similar to past titles, however we thought it might be fun to add a little bit more to the display. So as a result, if you are able to gain more points while the score feed is currently visible we'll add the points together and consider that a scoring chain. If you are able to chain enough together, the feed will start to change color and grow larger. There are multiple levels of display and only the most awesome of players will see them all. We've also added a lot of other small UI tweaks from your feedback (event feed notifications, navpoint updates, etc) that we hope will also help with communicating what's going on. Aside from just UI improvements, we also wanted to add more variety to the overall experience as well. So we've added "Protect Object(s),” a new objective type that is present on every map. In order to succeed in this new challenge, you and your team will need to work together to prevent waves of enemies from destroying high value targets. These targets vary in both what type of object you have to protect as well as how many objects there are. For example, you may be tasked with defending a single UNSC generator from an army of Knights, or you may find yourself protecting a collection of Forerunner artifacts from hordes of Hunters. 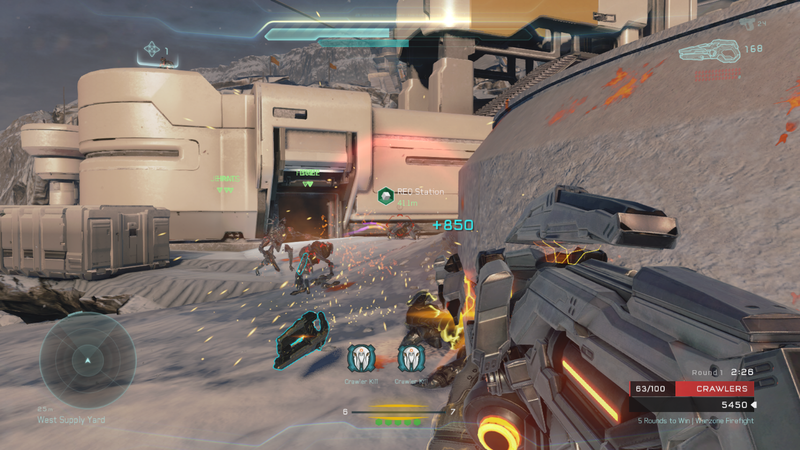 That's a small look at some of the new things you have coming your way with the Warzone Firefight update. Thanks for reading, I hope you all have fun! The physical size and layout of each map provides tons of variability to the experience. For example, Defending the Garage on A.R.C. is completely different than beating back foes on Darkstar’s Fortress. You’ll also find that specific weapons and vehicles work better on some maps than others. One of my personal favorites involves reigning down destruction from the skies on Stormbreak courtesy of my trusty Wasp, the newest addition to the UNSC arsenal. 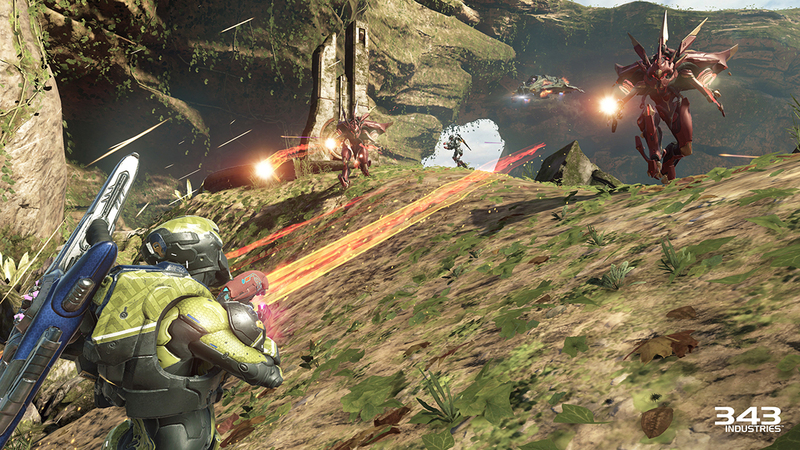 Across the entire studio, we’ve put an immense effort into the Warzone Firefight update. Since launching last year, this is without a doubt our largest release. We can’t wait to see how the players react once they get the chance to experience all of the new goodies for themselves. Warzone Firefight is a very different beast than the original version of Warzone, and thus it has required us to take a new look at the way we reward players XP and RP. Traditional Warzone rewards players based on a number of factors. First is participation, setting a baseline reward for being a part of a match and seeing it through to completion. Second is based on how well your team ranks, typically this is used to determine whether you get points for your team winning. Third, a big part of the reward comes from how well you performed in the match. Now in Firefight, a lot of this is flipped on its head. Participation is usually based on how long you were in the match, but in Firefight we want to reward you for being fast and efficient. Team ranking becomes problematic, as everyone is all on the same team, so win or lose your team is always number 1. Personal performance is very important in this mode, and needs to be rewarded appropriately, but more important is rewarding people for working together as a team and cooperating, so this can’t be the majority of all the rewards possible. 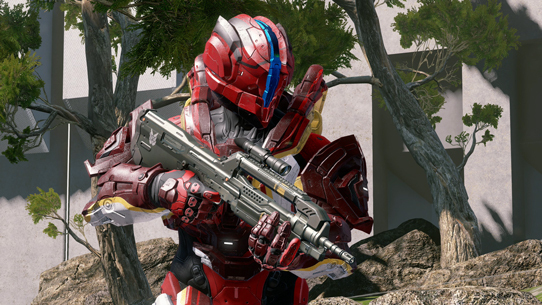 So, with that in mind, we’re adding a pair of new factors just for Warzone Firefight. You will be rewarded based on the number of rounds completed. The further you can make it into the match, the more XP and RP you will see. Make it all the way to the end, and you will reap even greater rewards from a speed bonus. The speed bonus is only applied if you have completed all the rounds of a match. So if you can clear all the rounds under their par times, you can really start getting some great XP and RP out of this mode! Well, gosh darnit. 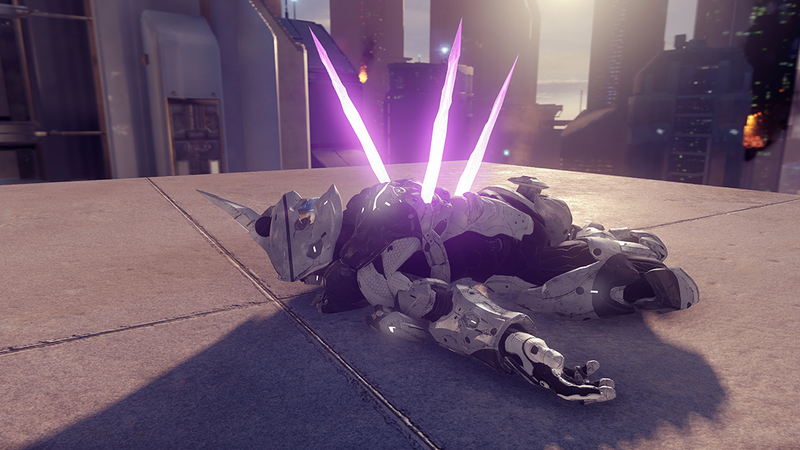 I love those guys, and I hope you’re excited to jump into the new-and-improved Warzone Firefight. Next up, we’ll hear from more devs I love, and after reading about the work they’ve been doing on some new maps, I think you will love them too. Take it away, multiplayer map moguls. Based on player feedback and the community’s desire for more variety in Warzone Assault environments, with Prospect we took up the challenge of creating a new map from the ground up specifically for Warzone Assault. The goal for Prospect was to create a closer-quarters map with a lot of height variation, similar to Skirmish at Darkstar. To help balance the combat interplay between infantry and vehicles, we gave on-foot players multiple traversal options. These asymmetrical paths create interesting advantages for attackers and defenders, as Prospect is an intense map with constant action. Based on playtest feedback, we worked hard to make sure each base was balanced and fun to fight over. At the start of the match, attackers start at a higher elevation than defenders in the Armory. In order to capture that base, attackers will need to cross a “no man’s land,” exposing themselves to enemy fire. If the attackers are successful in capturing the Armory, their job isn’t over yet. In the battle for the modified Garage, the height advantage is reversed with defenders enjoying the high ground. In the Garage, players will notice numerous additional paths to the first and second floors and additional cover to encourage close quarters combat. Like the Garage, we added new structures to the Home Base, creating more opportunities for attacking and defending the Core. There is additional cover at the front of the base to encourage defenders to push out from the interior, while providing them more protection from air attacks. We also added secondary objectives in the form of two gates that prevent attackers from immediately rushing in with heavy vehicles. To open up these vehicle paths, attackers must capture and activate control panels located above the gates. We’re excited for players to being battling across Prospect next week with the launch of the Warzone Firefight Update! For this map, I wanted clear and wide vehicle paths with plenty of loops going around the map and optional paths and jumps to encourage vehicle stunts. For infantry, we put extra importance on covered bee-line paths so that players can quickly get around while reasonably protected. To give players a stronger sense of location, I chose two very distinct visual themes for each side of the map. On one side, we have an open dry desert with swirling shapes that are shaped to match the gameplay flow. For visual inspiration, we used alien-like desert locations like the Paria Canyon in Utah. For the other side, we created a bowl-like area surrounded by cliffs and waterfalls, creating a “microclimate” that is lush and full of greenery. The Temple is the key landmark – it is carved out of solid rock and is visible from anywhere in the map. It features twin, ancient Sangheli statues flanking the temple on either side, which ties the contrasting themes together. Attack on Sanctum was a lot of fun to work on because in some ways, it was like working on two different maps. In addition to the grandiose exterior combat spaces Mattias mentioned, Sanctum features a huge center complex perfect for combat in a space we call the Temple. 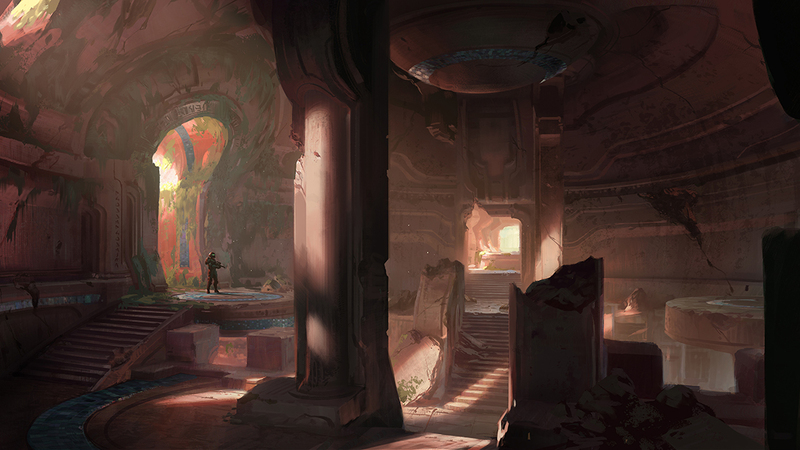 I worked with Ben Nicholas, one of our environment artists, on the interior of the Temple. We worked on making the capture area on the ground floor feel like a small Arena map with a plethora of symmetrical bridges, ramps and cover, bisected by a vehicular pass through. The second floor, only accessible via grav lifts and crafty pilots, houses the Legendary and Mythic bosses that come in throughout the match. We wanted to create a space that promotes personal combat with these bosses, away from ground vehicles and cowardly snipers (Bravo note: OOOOH! BURN!! ), creating a unique feel to these fights. A major theme I wanted to convey early on in designing this map was a theme of battles between Promethean and Covenant forces. It’s always awesome coming into a space and seeing a big fight happening in front of you. I wanted to start the map out with a bang - with two bosses duking it out as you land. 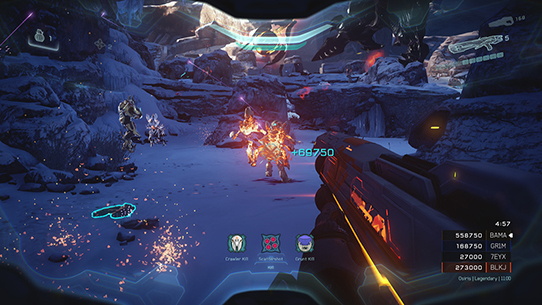 Players are encouraged to be aggressive in eliminating all threats, and teams who are slow on the trigger can miss out on one of the bosses if they fall to their opposing AI force. The initial defenders at all the field bases (Garages and Temple) have Covenant and Prometheans fighting, creating hectic four way battles. 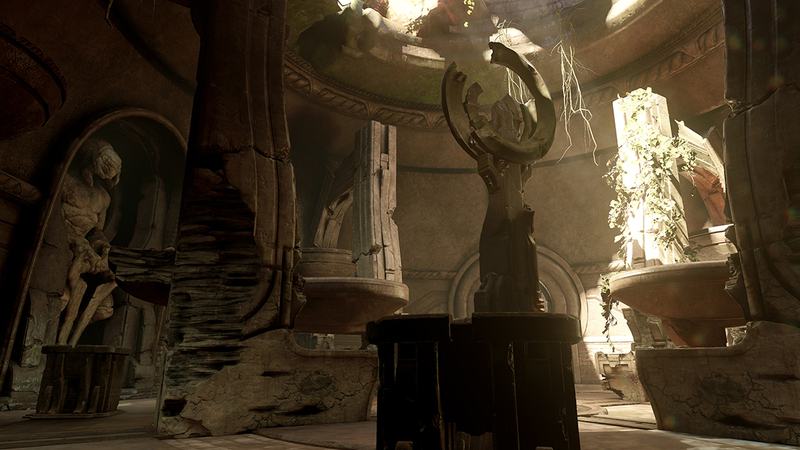 Attack on Sanctum features the largest ground and air combat spaces of any location across all of Warzone and players will no doubt spend hours and hours exploring and taking in all of its beauty. Next week, a new Arena map is dropping as well. It goes by the name of Molten, and it lends itself quite well to Team Slayer and Strongholds gameplay. The map not only has unique gameplay flow, but quite a unique look and feel as well. For more, I hand things over to the very capable hands of Christopher Hands. 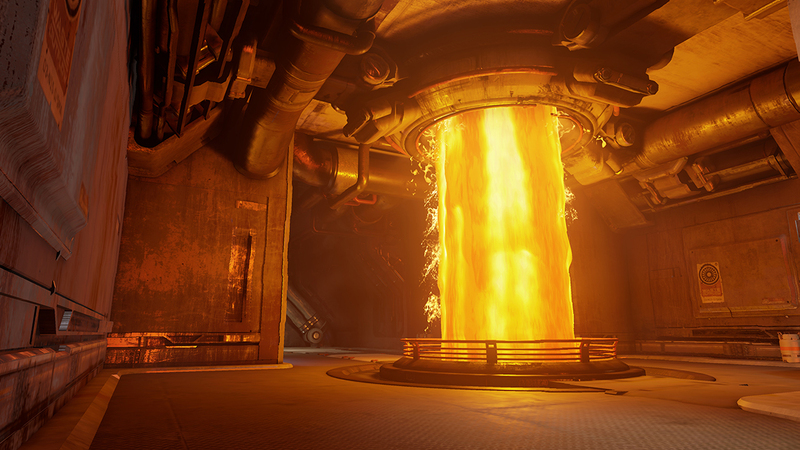 Molten was an interesting challenge for us, it’s the first map to incorporate Lava that the players interact with, and is a major feature of the map. The tech required to create the lava hadn’t been built yet, so a lot of teams had to work together to solve this puzzle; Chris Woods’ team and FX were a huge part of the process. 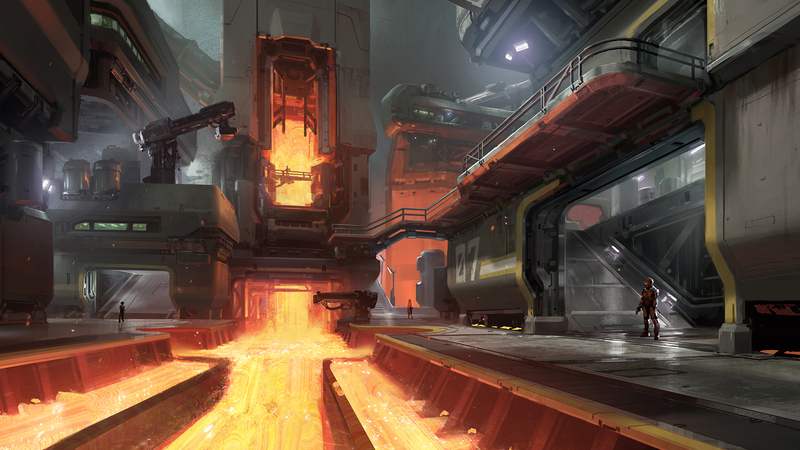 My initial pitch for the map was: “I want to make the most metal map in Halo,” so we placed the smelting plant within an active volcano with lava throughout, I’d say we succeeded! We had a lot of fun building Molten, it was the first map where the more we scarred and burned the environment, the better it looked. Since the map is asymmetrical, we spent a lot of time trying to build unique callouts such as Oven and Cooling (we called it coolant room internally). 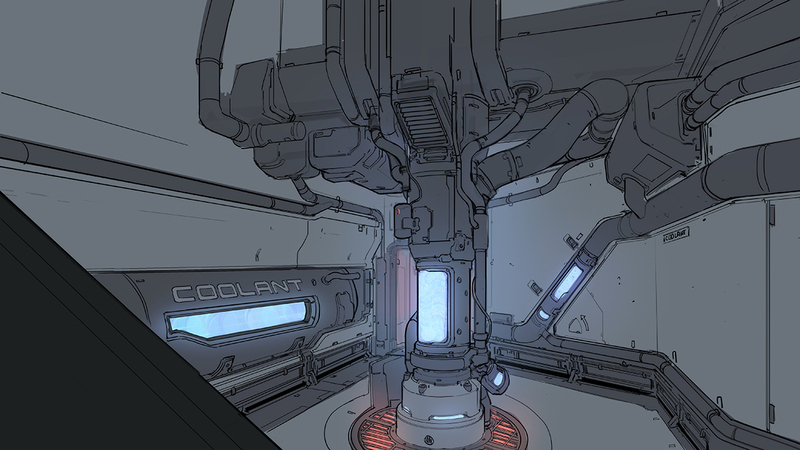 Cooling was a great example of how far we wanted to push the theme, we knew we wanted to have a room that stood out from the rest but still fit. Overall I’m very proud of Molten, it’s a small unique map that was a lot of fun to work on. I look forward to playing it when it’s out in the wild! We’re saving a few surprises within Tidal – the upcoming Forge canvas - for next week’s live stream. Be sure to tune in on Tuesday at 2PM P.T. at Twitch.tv/Halo. There’s a new boss in town. 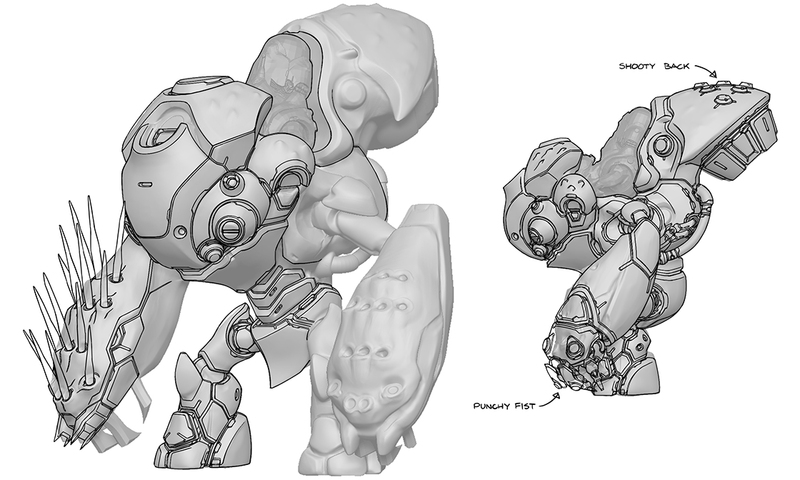 We announced the Grunt Goblin, an all-new Grunt Mech boss, earlier this week, and today, we’re taking a look at how this guy came to be, straight from the designers and devs who brought him to life. Go Go Grunt Goblin! For Halo 5 at launch, all of our Warzone bosses were Campaign enemies with some different tuning, normally in terms of health and damage output. We needed some more variety, and wanted to build an enemy from the ground up to be a Warzone boss, with a few goals: tough but still satisfying to fight, able to threaten multiple players simultaneously, and dangerous to vehicles without being unfair to players on foot. We identified some promising directions, and then shelved the plans for a while. A few months after Halo 5 shipped, Kyle Hefley showed me a concept from the start of 2013 (made in some downtime in between Halo 4 and Halo 5), of a gigantic, grunt-shaped mech. We showed it to the whole character team in an art review meeting, and everyone immediately fell in love, we tossed around some gameplay, then set it aside for a few weeks, figuring that it might be a good character to build for a future Halo game. Then came the Hackathon. The whole studio split into small teams, each spending a few days working on a prototype of a feature for the future of Halo. Around 10 of us decided this would be a great opportunity to prove the viability of what was then simply called the Grunt Mech (actually called Mecha in data, for the anime fans). We built a rough prototype mesh, hacked it up to work on the Grunt skeleton so that we could re-use existing animations (saving animation resources for new features, and to see if Grunt animations could actually work scaled up – spoiler, they did not), recorded some hilarious temporary voiceover and audio, prototyped a new anti-vehicle Needler weapon and another, much more dangerous [REDACTED] weapon for the upgraded variant. A prototype of a feature we’d spec’d out for a future project, the Multi-Target Tracked Attack, conveniently came online just in time for the Hackathon, and we used that as the Mech’s secondary attack. Response from the whole team at 343 was incredibly positive, clearly the idea had legs, and the path to ship was so clear that we decided to adjust our schedule to squeeze it into Halo 5 post-launch content. Initially, the mech’s slow movement speed made it too easy to kite, so we added a faster, forward-only run, letting it cover ground much faster and chase down players on foot or in slower vehicles. 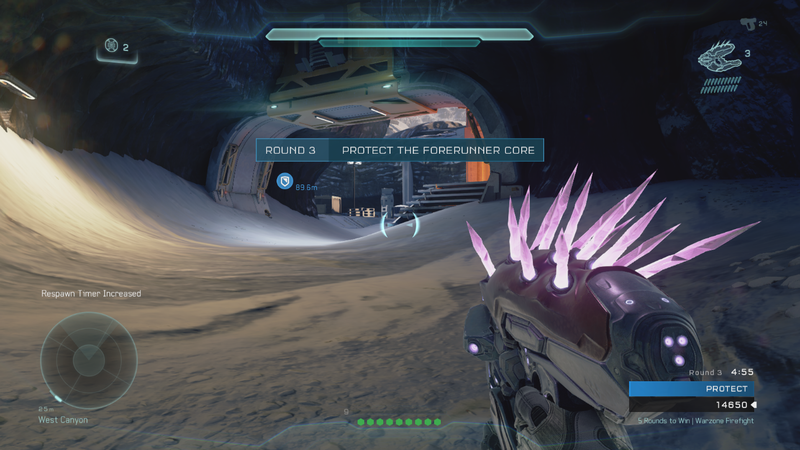 Having the cockpit exposed encouraged players to shoot the grunt itself, and rather than ignoring that urge, we opted to cover him with a shield canopy, encouraging players to break it to get to him. The armor justifies high health, but we made it progressively break off, helping to convey damage state, give hit feedback and reveal some weak spots. Trying to address targets on foot with power weapons in addition to in vehicles, we retuned the Dual-Needler needles to be fairly easy to dodge on foot, but lethal if they hit, however against vehicles made them hard to dodge and deal massive supercombine damage, encouraging cautious vehicle use around the mech. Most enemies can’t effectively threaten multiple targets, and will ignore dangerous targets from time to time, so the needle barrage can target up to 8 players simultaneously, requiring all players to actively dodge, but also to be present in the battle – if there are fewer than 8 players, it will hit some targets with multiple needle bursts, with lethal results. The needle barrage is pretty hard to avoid if you’re not watching for it – we’re shipping this (but may make adjustments later)! We found that players could safely hang back in a vehicle or on a ledge, and added the ability to jump long distances – up to 200 feet at once – to close distance. Most enemies don’t have a good response to ramming attacks from a vehicle, which players exploited in early playtests, so we changed the Mech’s anti-vehicle brace into a close-range area-of-effect EMP attack. To give us some more boss variety we also made a variant. The base Grunt Goblin is tuned to threaten players on foot, in a Warthog, Ghost or Wraith: the damage output – particularly supercombine and melee - is tuned around mid-tier vehicles – once an attack deals enough damage to kill a player it might as well go high enough to threaten vehicles. The variant is equipped with a more dangerous Dual-Needler, a needle barrage that fires more needles (allowing it to supercombine all players simultaneously if they don’t dodge or break line of sight), a nastier grenade, more health and a tougher canopy, to go toe to toe with Mantises and Scorpions. Given that the Mech is tuned around Warzone Firefight, it has to stand up to combined fire from 8 players with power weapons and vehicles, giving a satisfying challenge and not dying early enough for it to be anticlimactic. This means that tackling it one-on-one is likely to end poorly – a future campaign-tuned variant would be a lot of fun though (maybe too much fun?). One note: a Grunt is shorter but wider than a Spartan, they actually require around the same amount of space (not relevant right now, but at some point, maybe?). As Chris alluded to, the Grunt Mech started as a pitch concept between Gabriel Garza and myself prior to the start of Halo 5 production. I was trying to come up with an additional class for the Grunt, something akin to a Grunt general, that would stand out as a leader in the absence of an Elite. The intention from the get-go was always to push the comedic elements of the Grunt, while making something that would add an extra layer of challenge for the player. After running through some tests working on a more heavily armored grunt, we shifted our focus onto making a vehicle that the Grunt would ride in. The idea evolved from there into it being the Covenant’s (or the Grunt’s) response to the Mantis. The Grunt Mech was born. As work started coming in for Halo 5 though the idea had to be set on the backburner, but when the topic of Warzone bosses came up it felt like a good opportunity to bring it back to the forefront. In building the Grunt Mech for Warzone, we had the opportunity to explore making a vehicle that could have a great deal of modularity to the components in its design. So the Grunt Mech has been built from the ground up to allow for future upgrades and additional functionality with its arms, canopy and thruster pack. As Chris stated before, we tried to get the Grunt Mech up and running as quickly as possible for the Hackathon, and that meant initially using Grunt animations as a base. While this was a huge help in unblocking design and devs from a content perspective, it was clear to the animators (Joe Garhan and myself) that this was not going to hold up in the long term. Due to how fast we needed to move, we decided to time box the animation work and create our priorities based on what we were seeing in playtests. Our goal was to retain the vibe of our beloved grunts while also embracing a classic robot aesthetic. When I first saw the Grunt Mech concept sketches, I fell in love with him immediately. I was so excited to bring the Grunt Mech to life through FX. As the animations began coming in and Chris’ weapon ideas became finalized, we started to see what kind of FX were needed. Big dust/dirt impacts for when he slams his fist into the ground, large electrical explosions when you shoot off his eye sockets, canopy and backpack. As well as lingering smoke, fire and sparks to go along with all those destructible pieces on him. Adding those in really gives you a sense of satisfaction and progression when fighting him, which is essential for such a tough boss. Now when you finally land that killing blow on the Grunt Mech, there of course has to be a giant epic explosion that goes off when he hits the ground! For me, creating that effect was by far the most fun aspect of working on him, and getting to see that big explosion go off when you kill him in game is really, really awesome. 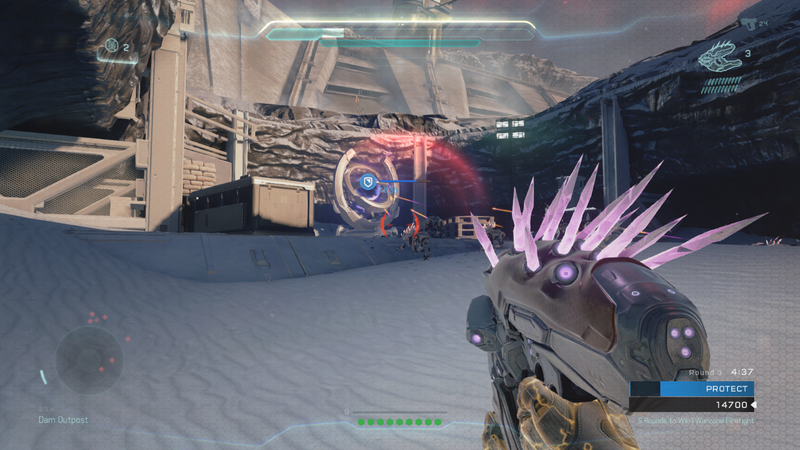 One of the most unique things about the Grunt Mech is the giant Needler weapon attached to his arm, so naturally we had to modify the existing Needler projectiles to match his big gun (more than doubled in size, by the way). Seeing the huge needles fly at you and hit your teammates is a hilarious and crazy moment that I will always enjoy seeing. They stick out about 2 feet away from your body when hit, so if your friends are laughing at you, that’s probably why! I’m sure players will also get a kick out of the even more super super-combine explosion that goes off when enough of them stick to you as well. He is a really tough boss and I can’t wait for everyone to get out there and fight him. Next up, we throw over to Grim to talk RTX, the Wasp, and more. Thanks Barvo, this past week has been an eventful one to say the least – coming off of the E3 craze and straight into Warzone Firefight hype, and all while preparing for a little fun in big Texas. Halo’s presence at RTX this year is shaping up to be a blast, from booth events on the show floor, a killer panel, and awesome prizes to compete for. Halo fans of all walks will find something to fit their fancy: didn’t make it out to E3? Don’t worry, we’ve got Halo Wars 2playable with a new mode called Strongholds. Bittersweet about the fact that Warzone Firefight will be out in the wild, but you’ll be at the event? We got you – Firefight will be playable on the show floor for RTX loyalists. Been watching the HCS Pro League and thinking “Hey, I could do that…”? Well, time to put your Mjolnir where your money might be in our Halo 5 FFA Open, a free-for-all tournament that will see players fighting for a $5,000 prize pool. Throw in an hour of Halo hilarity – hosted by Bravo and yours truly – that will see Rooster Teeth personalities take on show-goers in crazy Halo gametypes live on center stage, and you’ve got yourself one tasty recipe for Halo happiness. Oh, and did we mention a panel that talks Forge, Halo Wars 2, Rooster Teeth, Loot Crate, and more? Yeah, there’s that too. Catch more details at our RTX blog here, including details on how you can get involved, whether on the show floor or by tuning in at specific times on twitch.tv/RoosterTeeth. No matter how you are able to experience our Halo haven at RTX 2016, we’re excited to have the incredible community along for the ride. Make sure you follow @Halo and @RTXevent for all the latest news and updates. See you there! GRIM: So Tim, can you tell us a bit about the general ideas and themes that went into creating the Wasp? TIM: The inspiration with the Wasp was to create a light strike fighter vehicle that focuses on agility rather than armor or pure offensive power, allowing for Warzone deployment at an earlier stage than Banshees and Phaetons. With dual chainguns and missile pods, the Wasp is super deadly in the right hands and allows for early advantages in Warzone to the team who controls the skies. GRIM: Nice! Glad to hear that it will indeed help fill a unique combat role in relation to other playable aircraft. Can you talk about any particularly useful strategies that Wasp pilots might employ? TIM: If you’re flying the Wasp, use its recharging shields and agility to your advantage to keep damage off its light armor. Stay low to reduce line of sight to ground targets until your shields recharge, then pop back up for a strafing run. If you find yourself against a Banshee, keep moving! Drop altitude and strafe to outmaneuver its bombs, then flank the Banshee and use your chaingun and missiles simultaneously to maximize damage. GRIM: Now, what about on the other end of the spectrum – what should I do if I come up against a Wasp-wielding enemy Spartan? TIM: For infantry fighting the Wasp, your best bet for a quick takedown is to use explosive weaponry. Rockets and Hydra launchers will make quick work of a Wasp. If you’re equipped only with small arms, target the rotors on either wing for extra damage, or try to bring it down from the sky using a charged Plasma Pistol shot. Snipers: Snipe the pilot for a clean takedown and the envy of your teammates. GRIM: Eh, snipers get all the love. At any rate, thanks for chatting. And thanks to your team for all the effort in crafting a new UNSC aerial experience! The Halo Wars 2 Multiplayer Beta has finally come to a conclusion, and we couldn’t be more pleased with all of the invaluable feedback provided by the community. If you haven’t noticed, we’ve been keeping a close eye on the leaderboard to see what player came out on top with the most wins. In the end, there could be only one king of the Halo Wars 2 hill, and that king is YoungBerk. Over a ten-day span, YoungBerk accumulated a ridiculously impressive resume, conquering nearly all comers, and easily setting the standard for competitive Halo RTS-ers to shoot for come February, when Halo Wars 2 hits the wild in full force. To see the final top 10, head here. We’ll have more news to come in the near future regarding Beta participation, including the top 10% players for each faction – each of whom will be earning themselves a sweet new ride for their Xbox Live Avatar. Stay tuned! Our friendly neighborhood Consumer Products team wanted to let the community know that we’ve got some pretty slick new Halo gear in the Halo Waypoint Store, including some cool new t-shirts (which will come in handy to beat the Austin heat at RTX), and awesome accessories, like the Blue Team beanie (which will admittedly come in much less handy for beating the Texas Summer). Make sure you check it out, especially since we have this little thing called the Summer of Halo going on – go get some deals on the new Halo hawtness! Thanks Grim. And that, my friends will do for this week. Thanks for joining us for one of the lengthiest and most dev-diary packed Community Updates to date. We hope you’re excited about what’s ahead, and we’ll see you on Tuesday at 2PM P.T. at Twitch.tv/Halo for the next stream. We have returned from the annual pilgrimage of E3. In mostly one piece. Over the past four days, thousands of players stopped by the Halo Wars 2 booth to get hands-on with PC and Xbox One, and many more of you have joined the Halo Wars 2 beta, which still has a few days remaining. In fact, to thank you for your playtime, patience, and enthusiasm, we’ll be extending the Halo Wars 2 Beta on Xbox One through Wednesday, June 22. We hope you’re able to get a few extra battles in.